It has been a while since we have done a 10 questions Posting, and to be honest its difficult to get folks to offer their time to answer the questions. Oscar Furlong however, was gracious enough to spend a few minutes answering these questions. Oscar Furlong is a frequent flyer at the Norton field, and has been a PVMAC member for 5 years. Oscar also attends most monthly Club meetings, and while in attendace at these meetings, he seems to win something. I am a motorcycle mechanic running a small shop with my two sons. I have been in the hobby for 9 years. My dad used to buy me plastic models when I was a kid. 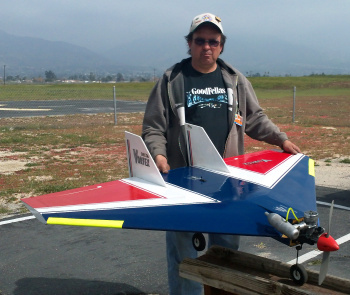 When I was 7, I made my own kites and rockets, but my first RC was a cox cesna 182. I bought it on 1998 but I didn't fly it until 2003, and crashed it, of course. 3 months later I found an RC instructor at a local hobby store and he tought me to fly. 3d, scale, edf's and helicopters, but now I focus on helis. Building, I really like to build, and then see if it fly. Too many, but all the events at the field are a great memories. An ultimate biplane 85cc gas engine. I am planing on helicopter flight training to fly ultralight Helicopters. Why? because the price of a small heli is like a big SUV, and I can transport in a trailer and storage it in my back yard. Oh, and I like helis.